I love this sort of incidental trivia that you can accidentally stumble across on the web. Even 43 years after the fact you can still learn something new about a Beatles album cover that’s been seen millions and millions of times…. 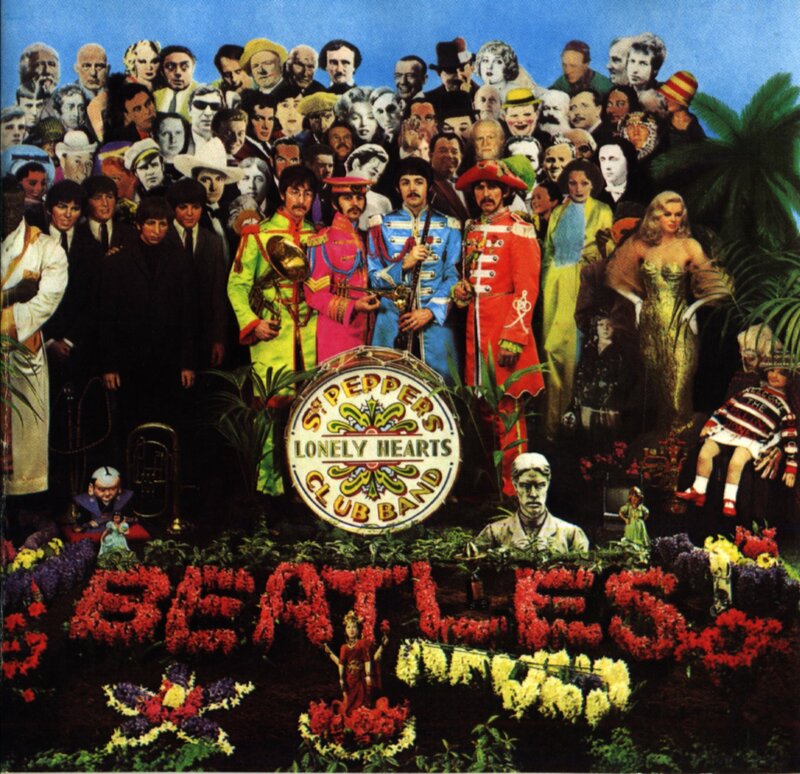 I bet like me you’ve stared at the “Sgt Pepper” cover wondering about who was who and what was what, asking yourself why the Beatles and artist Peter Blake had chosen and placed all the items they did for their legendary and ground-breaking cover. Now another small piece of the mystery has been revealed – and it comes from an unlikely source. Well, check out this article in the Japan Times. Turns out “it’s a Sony”. It’s not that this connection hasn’t been noticed before. A year ago Sony itself posted this message on its own blog site, which confirmed it was a in fact a Sony television set (a model TV9-306UB in fact, which would have been fairly state-of-the-art as far as TV’s go back in the day). It’s just confirmation now that it was actually Paul McCartney’s very own TV set. From the articles and posts I also learned that the small Japanese figurine at the feet of the wax Beatles from Madame Tussauds is a Japanese fukusuke fortune doll owned by John Lennon. Who would have thought? (Wikipedia has a list of the people and items in the picture). This entry was posted in Beatles, Beatles Collecting, Beatles Music, Beatles Related, John Lennon, Paul McCartney and tagged Beatles, Beatles Collecting, Beatles Related, John Lennon, Paul McCartney, Sgt Pepper cover, Sgt. Pepper by beatlesblogger. Bookmark the permalink. I wrote a little bit about this TV last October in WogBlog, and my searches found that it had been John Lennon’s. Thanks for the info from your Blog (which I admire and read every day). I really don’t have any other sources for the story from the Japan Times stating it was Paul’s TV. They say that the Okazaki City Mindscape Museum (which I looked up on the web – it exists) will be displaying the invoice and the same model Sony TV at a “Swingin’ London” exhibit next January. I guess we can only wait until then when they may publish something more about the exhibition. Until then I have utmost faith in your contacts and research which show it to be John Lennon’s TV – you’ve certainly got credibility in my book! (A recent example I remember is when you had all the information about the forthcoming “Come and Get It” Apple Best-Of CD literally months ahead of everyone else). All the best. Just happened upon this post again and decided to look and see if the Okazaki City Mindscape Museum in fact has that “Swingin’ London” exhipit on. It does! My Japanese is non-existent so I put some text from the site into Google Translate and it came back with: “Famous Beatles record jacket ・ (・ サージェント・ペパーズ・ロンリー・ハーツ Club Band) that was captured on television unravel the mystery of the “bill signed by Paul McCartney (invoice),” and so I reckon we are still working out the mystery of the who owned the TV set! I will post an article about Jann and her work soon. Sorry but you have the wrong doll circled. The Japanese Fukusuke fortune doll is more on the left side by the hooka and the flugelhorn! Hi, the circle is around the TV set, not the Japanese doll mentioned in the text. 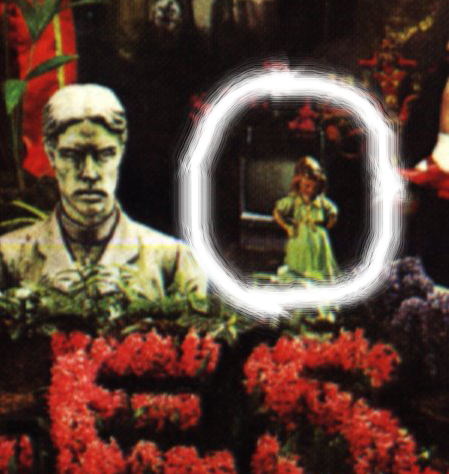 For info on the little green girl figurine in the circle see the replies beneath the main article. We actually got one from the artist Jann Howarth (who worked with Peter Blake on the “Sgt Pepper” cover) who says she and Blake were the owners of that figurine. She also says that she was the creator of the old lady who can be seen holding the Shirley Temple doll (it is on the far right of the cover). She says she still has it!